The weather is ideal & I have my ambition back. Lar will come to dinner tonite -- for 6 weeks they will come on Wed. as Lar prefers not to lay soccer after a meal on Thurs. But Kim can't come tonite as she has another golf tournament & they close with a dinner. The water is off for a couple of hours (10:45 A.M.) as they are putting a new hydrant up the street. Dale came home after his late Tuesday & said "See what we will wear on Fridays". A shirt -- NASCAR with Dodge, etc. on it. Short sleeved, black with a red yoke front & back. He doesn't like bright colors so I teased him a bit. We've had corn a few times & it has been excellent. Peaches have been good & local blueberries. Big & sweet. Dale likes them on cereal. Millie said the funeral was well attended. Gen held up OK both at calling hours & service. I'll enclose what Millie sent me. Yesterday Barb didn't have to watch Scott so she washed windows inside & out. Downstairs windows. I'm thinking about rearranging my bedroom but I'll wait til September when Dale takes another week's vacation so he can help me. I wish we could put the TV in another spot but that means changing wires, etc. so I guess it will stay where it is. I'd like to put the sofa on the wall where the TV is. It would make the room look bigger. At least I think so. Next Sunday the service will be at Chapman Dam followed by a family picnic. I wont' be going & I don't believe they should ever close the church on Sundays. Best gets a perm tomorrow & on Friday we plan to go to Jamestown. This school year Scott will eat lunch at school -- he takes the new medication -- so he doesn't have to take it at lunch. Lynn doesn't like people to know he takes meds. Scott hates taking the buss so now Barb will pick him up & be there til 4:30. Marisa isn't reliable to watch him. They have rented their building to another trucking firm, offices & all. They still have an office there & maybe part of the garage for repairs, so Bob keeps busy. 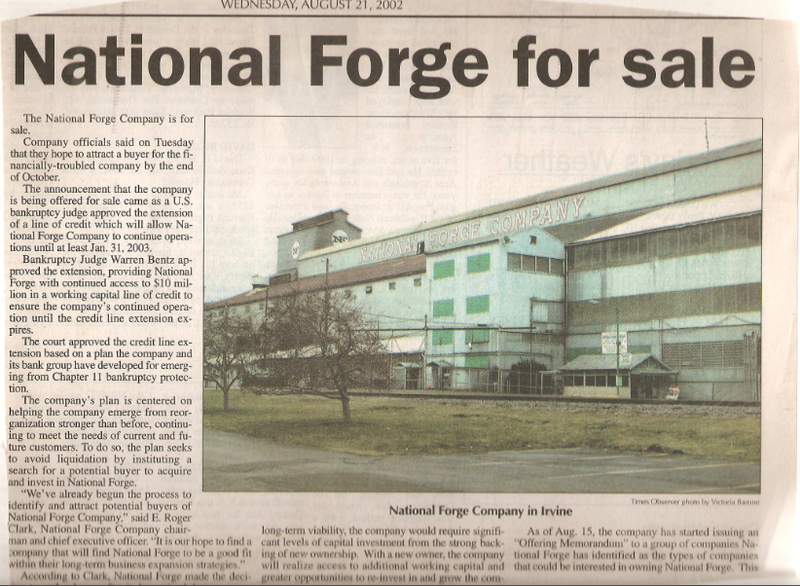 Today's paper said National Forge is up for sale. If that goes Warren will really be a ghost town. When Torey first saw Dale last nite, Dale had his work uniform & barked at Dale. Later on, when Dale had changed, he was begging Dale for the treats he buys for Torey. Someone was conducting a survey -- whether you drink Pepsi or Coke. I said neither. He was surprised. Barb is very pleased with her perm. It looks so nice. Had a letter from Darla today. The grass has been planted around the house & should be ready to mow soon. Gerald still has a lot of stuff to go thru but they are enjoying the house. Easy to keep up. They've had company -- their kids & Darla was busy cooking for them but happy to have them. Charles & Sandy stopped by & she cooked dinner for them. 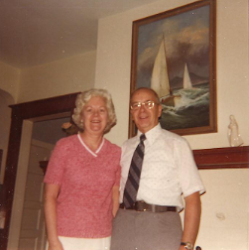 Carolyn & Jim were in Iron Mountain & they met them for dinner at Pine Mountain. Afterwards they went to see their house & visited awhile. Darla is working at the Hospital gift shop once a week. She enjoys getting out & meeting people. Good for her. We are expecting showers today -- but none so far. This A.M. I did it -- I changed my bed to under the windows. Now I'll only wash my sheets every other week. One week I'll sleep on the left side & the right side the next. This way it is a little easier to get up during the nite form either side. I put a belt around each wheel of the frame & pulled. I don't have any aches of pains so I guess I didn't hurt myself. I got half of the room cleaned. That's all I could manage today. Got rid of dust & vacuumed where the bed was. I also found some summer tops in a box between (watching TV) under the bed. I still have a few things to put away in my room so I'll sign off for this time. Dale looked nice in the Dodge NASCAR shirft. The short sleeves are also red. A bright red.